You'd be hard-pressed these days to find a literary person in the world who hasn't at least heard of Gillian Flynn's Gone Girl, even if they haven't read it. But the novel that took the world by storm last summer, while excellent, is by no means the first of its kind; Flynn's works follow in a long tradition of female authors writing on the subject of domestic suspense. Sarah Weinman's superbly curated collection, Troubled Daughters, Twisted Wives, aims to look back at the writing and writers that made the genre of domestic suspense not only possible, but popular. Because there was a time, surprisingly not so long ago, when mysteries focused only on police dramas and whodunit tales, and offered no place for the world of domestic living--marriage, household chores, childcare, the like. The collection of fourteen tales features female writers from the 1940s to the 1970s, a group of women who, like others of their times, helped to shift the standard mystery story from detectives and whodunits to the mystery of the everyday lives of women. The stories center on women caring for children, starting careers, running away, getting married, struggling with romance. And they are excellent. The list of authors ranges from those whose names I recognized (Dorothy Hughes, Patricia Highsmith) to those buried somewhat by history (Helen Nielsen, Margaret Millar) to several in between. 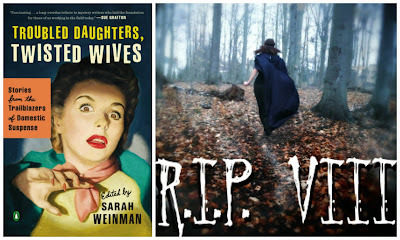 Weinman does an excellent job of introducing each author, giving context to each of the 14 stories, why they were selected, and how they fit into the canon of domestic suspense tales overall. These story-by-story introductions pair with Weinman's thorough introduction of the collection overall to give readers a brief history of female crime writing, tale of domestic suspense, and how we came to have writers such as Tana French and Gillian Flynn on our shelve today. Even if crime writing is not your standard cup of tea, Troubled Daughters, Twisted Wives is worth picking up; the stories can be browsed at once or one by one, and will give just enough of a taste of the genre to leave you hungry for more. But don't worry--Weinman thought of that, too, and has provided a list of suggested further reading at the end. Preview the introduction to Troubled Daughters, Twisted Wives on Huffington Post. See the full list of stories and authors included. I keep seeing this one popping up and it sounds like it's the perfect Halloween read! I love that there's just enough to dip into a bit of each author.